Bel-Aire is the specialty store of indoor air quality products. Originally founded in 1965 by John Kenney, Bel-Aire started as a New England area factory authorized service center for electronic air cleaners. In 1996 John's son, Dave Kenney created Bel-Aire's first online store where orders were called in. In 1999 Bel-Aire's 2nd generation online store was released with a secure shopping cart. In 2007 our 3rd generation store was released with unsurpassed product information and repair help. Bel-Aire is a pioneer of online technical support. Our web site provides comprehensive product information based on over a decade of online customer support. We have expert product knowledge, we have demo equipment to help us answer product questions, and we have test equipment for service questions. 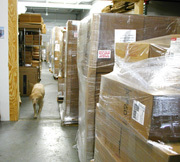 We stock and ship products from our warehouse in Attleboro, Massachusetts. In 1999 Bel-Aire's online sales exceeded John's expectations and Dave Kenney became the owner. Prior to 1999 Dave had worked a 20 year career as an electrical engineer developing cad software and worked the family business part time. Now Dave combines his family business experience with his software expertise to build the online store.